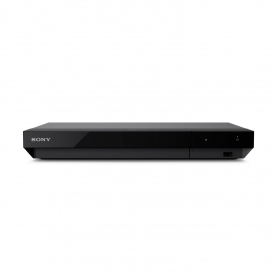 Enjoy cinematic standards from the comfort of your home with this Sony Blu-ray player. Featuring stunning surround sound and incredible 4K detail, be immersed in a range of high-quality audio-visual experiences. Discover picture quality inspired by the big screen with 4K UHD resolution. This lets you experience compatible content with four times the resolution of conventional Blu-ray™. See your favourite films crisper and clearer than ever before. With 4K upscaling, everything you watch is transformed into the highest quality output. Even the smallest details will be sharpened and boosted to deliver the best possible picture. The UBPX700BCEK is the ultimate addition to a high-resolution TV. But, you can even use it to watch 4K HD content on non-HDR TVs too, for enhanced shadows and highlights. Why settle for anything less? Not only does this Sony player offer the clarity of 4K, but it also uses High Dynamic Range (HDR) to optimise your content. This provides the perfect balance of brightness and colour for added realism. An HDR10 signal also boosts the brightness, without losing the depth of dark colours. Dolby Atmos®, DTS:X and Dolby® TrueHD decoding offer immersive surround sound to give an authentic home cinema experience. With top picture and sound quality, enjoy your favourite entertainment in a whole new light. You can watch 4K UHD Blu-ray discs easily on this Sony player, but the fun doesn’t end there. Watch and listen to a huge range of content, including most HD video and audio formats. Or, tune into a range of popular streaming services, including Spotify, for access to the latest hits. Enjoy up to 4K video streaming thanks to Wi-Fi with MIMO technology, which offers a strong signal – even on the edge of your network’s range. You can also listen to your favourite music in a variety of formats, from AAC and PCM audio to 11.2 MHz DSD. And, this Sony Blu-ray player is wireless thanks to Bluetooth audio transmission. 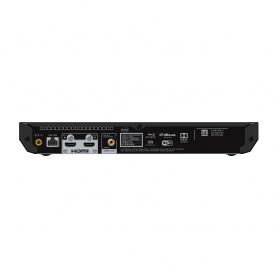 Connect your AV technology to the UBPX700BCEK with USB, HDMI or Coaxial Audio Out connections and enjoy fast, stable streaming. With such a variety of options, it’s the perfect choice for technology enthusiasts. Another impressive feature of this Sony Blu-ray player is Screen Mirroring. This allows you to share content from your compatible device to the TV screen for the whole family to see. With Wi-Fi Miracast, it’s wireless and easy to get started. 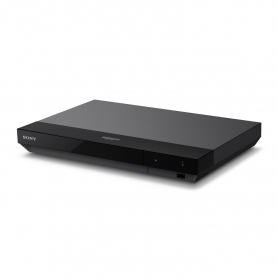 Available in a classic black casing, the UBPX700BCEK Blu-ray player will suit any home’s interior. It’s small enough to blend in with your existing devices, letting its features do the talking. This Sony model is even multi-room compatible – just connect the player to a compatible soundbar and enjoy rich audio from any room. The Sony UBPX700BCEK offers an impressive range of connection options, giving you access to a whole new world of entertainment.Add one to your basket today. Technology Get the best seat in the house with this 4K Ultra HD Blu-ray™ Player. Advanced surround sound, 4K detail, and vibrant High Dynamic Range images offer a visual experience never before possible. Format Enjoy fast, stable streaming from a variety of services. The UBP-X700 offers up to 4K video streaming thanks to Wi-Fi with MIMO technology, for a strong signal – even on the edge of your wireless network’s range. Format UHD Blu-ray Bring all your AV technology together and connect it to the UBP-X700. Ideal for home movies and music streaming services like Spotify, it has high quality connections to suit any technophile.